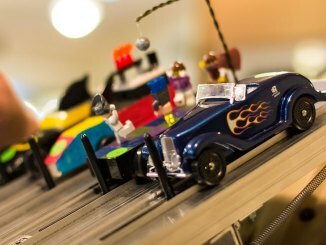 Scouts who placed first, second or third in their rank in their pack's pinewood derby can participate in the district pinewood derby. Car check-in will be on Friday from 7:00 - 9:30 pm. There will not be any check-in on Saturday morning. If you cannot make the check-in on Friday night, please contact James Trent at James_Trent@kindermorgan.com. 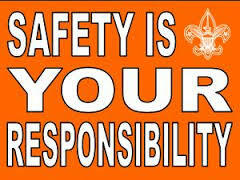 There are five divisions: Lion, Tiger, Wolf, Bear and Webelos Scouts. The derby will be run in heats for each of the four divisions. Each car will race multiple times and the average of the times recorded for each heat will yield the winner. Awards will be presented after each rank race is completed. To print the rules, scroll to the bottom of the page and click on Printable View. 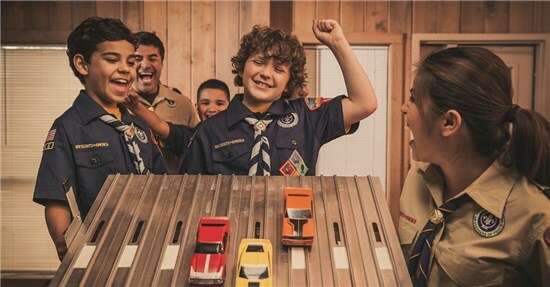 To participate in the district pinewood derby, a Scout must have placed 1st, 2nd or 3rd in their own pack race as attested to by the pack unit leader. a. The car must have 3/8” clearance underneath the body. b. The car must clear center guide rails with 1 ¾” clearance between the wheels. c. Fender flairs with less clearance are acceptable as long as the center rail width clearance is maintained. d. Weights are preferred to be inset in the body or on top of the car to aid in a safe stop at the end of the track. e. No part of the car or attachment to any car, which is metal, pointed, sharp, and/or jagged, may be capable of contacting any part of the track. a. All cars must have a wheel base no less than 4”, with the two rear wheels being positioned directly across the body of one another and the two front wheels being positioned directly across the body from one another. a. Height – Depending upon the track, the front of the car may rest against a short starting pin. Therefore the front bottom of the car which rests on the pin is no higher than ½” above the track. b. Width – The front end must be at least ½” wide in the center of the vehicle to make contact with the starting pin. c. Absolutely no part of the car body, wheels, or attachments may protrude in front of the starting pin. 7. The wood provided in the kit must be used. The block may be shaped any way that is desired. Additional woods may be added to the kit if desired, but the overall width and length requirements will still apply. a. Use of ONLY Official BSA Scout Grand Prix wheels is allowed. All lettering/numbering, both inside and outside, must remain complete and be visible. The fluting and other BSA markings on the outside wheel area must remain visible. Outer wheel surfaces may be sanded shaved, or polished to remove surface imperfections, mold casting burrs, and correct off-center wheel bores. Outer wheel surface must not be reshaped in any way in an attempt to minimize tread contact or alter aerodynamics. Tread surface must be flat and parallel to the wheel bore. Coning the hubs and truing the inside tread edge is allowed. Tread width may not be less than 7.5 mm. You may add material such as glue, fingernail polish, or table, to the inside of the wheel to aid in balancing the wheel; however NO MATERIAL MAY BE REMOVED FROM THE INSIDE SURFACES OF THE WHEEL. Minimum diameter of wheel is 1.16” to maintain the ridges of the outer edge. 9. The axles supplied with the kit must be used. They may be polished or lubricated. 10. Approved lubricants include (but are not limited to) Graphite, Teflon, Nyoil, and Krytox. Over-application of lubricant which results in excessive shedding onto the track is not allowed and no wet lubricants will be permitted on the car prior or during the race. 11. Wheel bearings, washers or bushings are prohibited. 12. The car must not ride on any type of springs. 13. The car must be freewheeling, with no starting devices. 14. No loose material of any kind, such as lead shot, may be used. 15. The car body may have no moving parts. Each car must pass inspection by a race official or delegates before it will be allowed to compete. The race official or delegates have the responsibility to disqualify those cars that do not meet these specifications. If during a race, a car leaves the track without interfering with its opponent, it shall be considered to have ended its heat at that point. If a car leaves its lane, at the event chair's sole discretion, they may inspect the track and, if a track fault is found which probably caused the initial violation; the race official may order the race to be rerun after the track is repaired. If during a race, no car reaches the finish line on the track, the car which went the farthest in its lane shall be declared as the heat winner. If during a race, a car leaves its lane and, in so doing, interferes with another racer, then the car at fault shall be declared to have lost the race heat. Any car losing wheels or any part that prevents it from running may be repaired after the inspection and weigh in. A race official may authorize repairs when damage is caused by a collision with another vehicle or object or if the vehicle is damaged in transport by a track official. The repair must be performed prior to the next heat and on the premises. Only after the car is repaired will the heat be run again. If the car cannot be repaired before its next race starts, that race will be delayed to allow time for the repair. Construction of all entries must have begun after last year's races. Only one lubrication is allowed before the beginning of the first race. 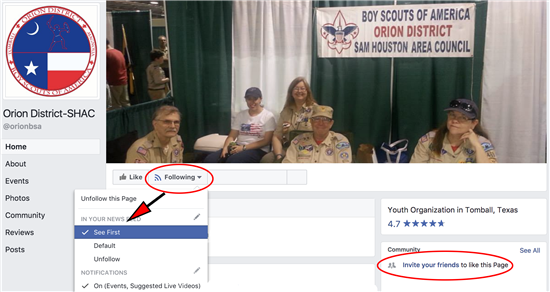 For questions, contact the pinewood derby chair or district activities chair.